Marie appears to two children Maximin and Mélanie, on September 19th, 1846 in the Mountains of Salette. A few years later, in 1861, Miss Deluy Fabry, comes on pilgrimage to Notre-Dame of Salette. She leaves Salette with the intuition to have to establish a religious Congregation being inspired by the apparition. She confides then in Mgr. Ginoulhiac, Bishop of Grenoble. September 17th, 1871, the Congregation of the Nuns of Notre-Dame of Salette is born. Very fast, it will more be known under the name of the "religieuses réparatrices" of Our Lady of la Salette. On February 2nd, 1930, in the diocese of Soissons, on the initiative of P. Crozet, Superior General of Missionaries of la Salette, is born the congregation of the Sisters Missionaries of Our Lady of la Salette. The spirituality and the Constitutions of these two congregations leaned on the Message of Our Lady of la Salette. A will of union of the salettine "family" begins to germinate. Discussions and notices are shared from 1955. A first spark had shone from 1944 but it was maybe little early. It is only after 1955 that the correspondences become regular and that the project of union becomes concret. In 1959, the general councils of both congregations meet to think about the union. The Missionaries of Our Lady of la Salette are going to play an important role in this progress. A workgroup consisted of two sisters of each of the congregations is set up to prepare temporary statutes. In 1961, the file of request of the union is sent to Rome. On January 20th, 1962, the Sacred Congregation of Religious authorized both Congregations to unite in only one under the title of: "Sisters of Our Lady of la Salette ". During February 1962, every Congregation gathered in chapter. This chapter aims at electing the temporary General Council of the Congregation of the Sisters of Our Lady of la Salette. March 25th, 1962: the union of both Congregations is officially realized. Every house receives, from his Eminence Bishop Fougerat, a circular indicating the Sisters elected for the Provisional Government. The union becomes effective following a new decree of the Holy See, on December 6th, 1965. The first chapter of the Congregation takes place in 1968. Four special chapters will allow the elaboration of Constitutions in 1968, 1969 and in 1980 and on 1981. Constitutions are approved by Bishop Matagrin, Bishop of Grenoble, one May 17th, 1986. 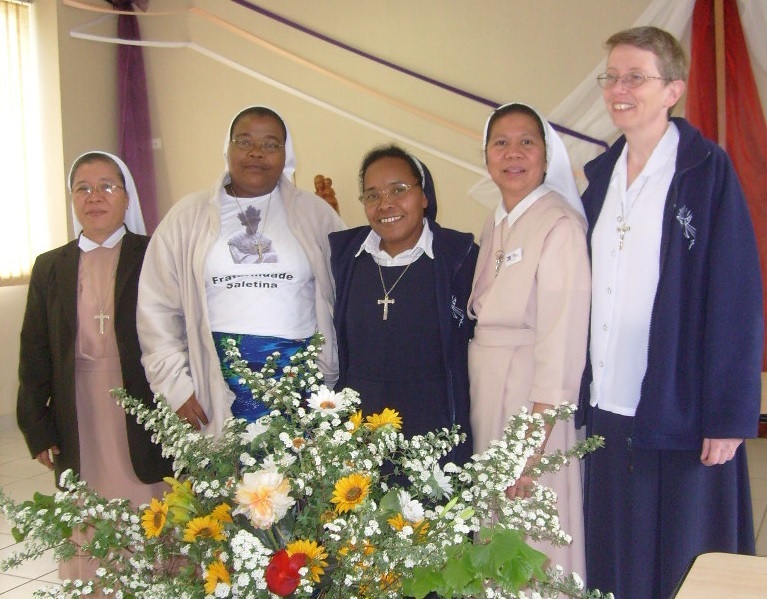 In 1997, in Angola, a community of the Sisters Messengers of Our Lady of la Salette is recognized by Bishop of Benguela. They merge with the La Salette Sisters in 2004. A fusion with religious Jésus Rédempteur and Marie Médiatrice finalized in April, 2013. A life given "The spirit of Reconciliation, as the Sisters discern it in the gesture and words of Mary in Her apparition is expressed by a life of prayer, sacrifice and apostolate". A life with international dimension "As the Father sent me, I too, send you" (Jn 20, 2). "I am the servant of the Lord, may I am made according to your word" (Lc 1, 38). "The spirit of Reconciliation, as the Sisters discern it in the gesture and words of Mary in Her apparition is expressed by a life of prayer, sacrifice and apostolate. Their prayer is joined with that of Mary who, in heaven, through Her constant intercession, never ceases to obtain for "Her People" the graves of salvation. Their sacrifice is realized in their self-offering to God, renewed each moment through their acceptance of the Father's will, which leads them, along with Mary, to share in the redemptive life of Christ and His sacrifice on the Cross. A community life rooted in prayer, a spirit of reconciliation, an effort of apostolate - such are the characteristics of the Congregation of the Sisters of Our Lady of la Salette. Today, La Salette Sisters are more or less 250 in 11 countries: France, Brazil, Madagascar, Philippines, USA, Poland, Angola, Myanmar, Italy, Canada, Algeria. They answer to the call of Christ in a life of community, prayer, gift, active presence with those who are needy. By all their life, they aim to be witnesses of the call of Christ to the reconciliation and the conversion.